Anyway, dearly beloved, I have come briefly to the surface to wave a little flag and try to summarise everything that’s been happening in the past two weeks. Let’s start with looking after my first horse who doesn’t belong to me or close family. This is exciting, awesome, and a bit stressful, but thankfully the aforementioned horse is a) an absolute saint and b) the Mutterer’s. Having been subject to my paranoia good intentions for the past several years, the Mutterer should know that his horse is likely to be just fine in my nervous but determined hands, God willing. The only difficulty is that the horse is grey, the kind of grey that can’t really be called grey at all and justifies being called white. Well, technically he’s white. Currently he’s a very strange piebald with some palomino going on in his mane. The poor guy frequently gets a thorough scrubbing. 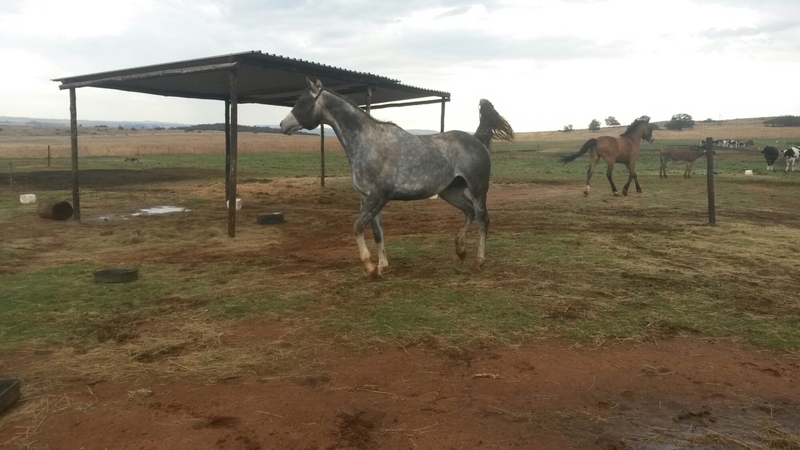 The white horse is in supply of ample amounts of mud, as the rainy season has come to the Highveld to stay. The grass is loving it, the horses are loving their crazy leaping racing games in it, and the humans are loving a break from the blistering sun. I did miss a few afternoons’ riding, but today I was tired, fed up and in obvious need of several hours of saddle time – and the horses were getting very bored – so I pulled up my socks. With the philosophy that Pommies ride in the rain all the time, which does not appear to have affected their success on the international circuit, I saddled up and rode in the drizzle. 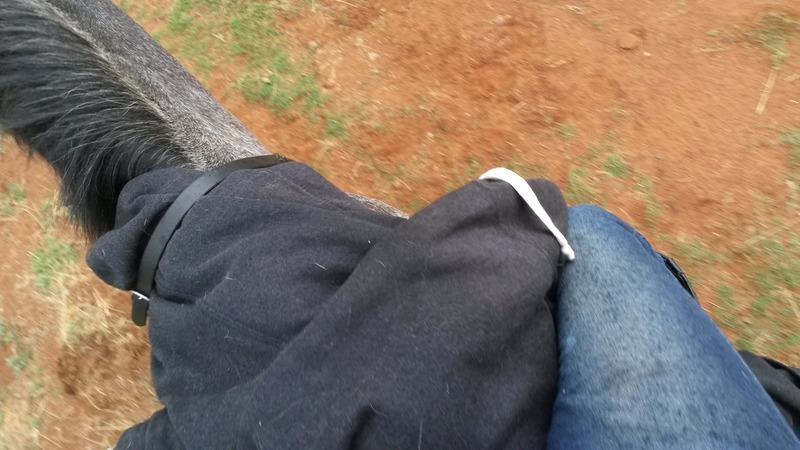 Arwen loved me for it, and when my beloved saddle started to get wet I sat on my hoodie and we had a wonderful time. Thunder was less happy with the whole idea, but put his little ears down into his thick mane and lived with it. Magic, who has learned to love the rain, originally dug in his toes and looked at me as if he knew that I had finally lost my marbles completely. The shelter, he explained with his top lip poking out and his hooves firmly planted, is the other way. I told him not to be such a wuss (which, actually, he is) and we ended up having a really good time. He realised that I was serious, so he put his head down and got to work despite the drizzle and made me dream wild dreams of a thoroughbred dressage horse. 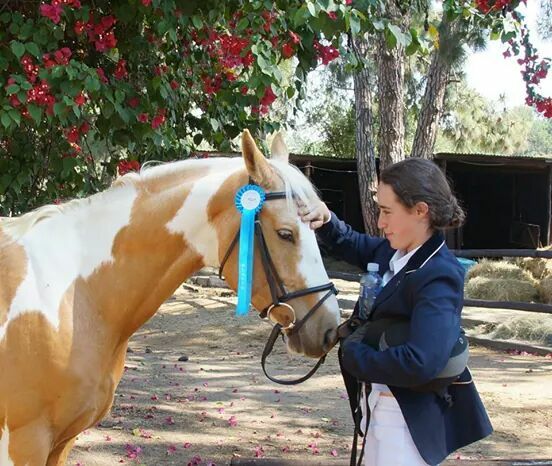 We also took the cutest, sweetest stallion ever to his first jumping show, where he was a little superstar. I couldn’t have asked for anything better in terms of manners. Although we first had to stop and inspect every jump on course before he would consent to jump it (from a standstill), we got a nice round out of him in the end and had no disqualifications, so I’m calling that a great success. Love him to bits. (Photo courtesy of Reed’s owner; please don’t use without permission). Last but certainly not least, my li’l sister finally found her dream horse, an Appendix QH by the name of Calval Abundant Flare. She goes as Flare to friends, Flare-Bear to my sister, and Flarehead to me (why? Because it rhymes with Airhead and I get a kick out of my sister’s face when I say it). She’s only five, but sensible far beyond her years; a steady little brick of a horse who’ll look after Rain for many years to come. Back into the downpour now. I have a hungry Horde to feed. On Nano, I write as Keleitha..